In the spirit of Judge Dredd and the current hit series The Boys, Marshal Law is a violent, satirical series about a futuristic law official charged with policing super-heroes gone rogue by any means necessary, all while fighting his own self-hatred for being the thing he hates most: a super-hero. 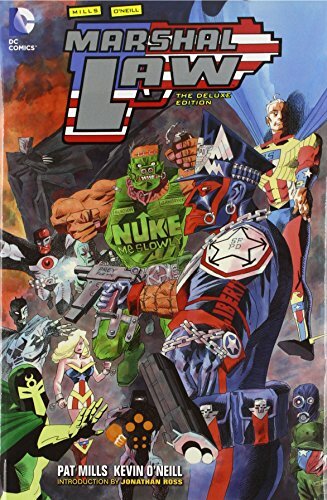 Featuring art by Kevin O'Neill, illustrator of The League of Extraordinary Gentlemen, the centerpiece of this massive volume is the original six-part tale in which Marshal Law hunts down the Sleepman, a serial killer who is somehow connected to the popular hero known as The Public Spirit. Pat Mills is one of Britain's most popular writers and comics editors, and is often credited for having revitalized the comics industry in Britain in the 1970s. After working on several war titles, Mills developed morally ambiguous heroes including Nemesis the Warlock and the ABC Warriors. He continues to write dark science fiction series like Slaine and American Reaper, as well as several Doctor Who radio plays."